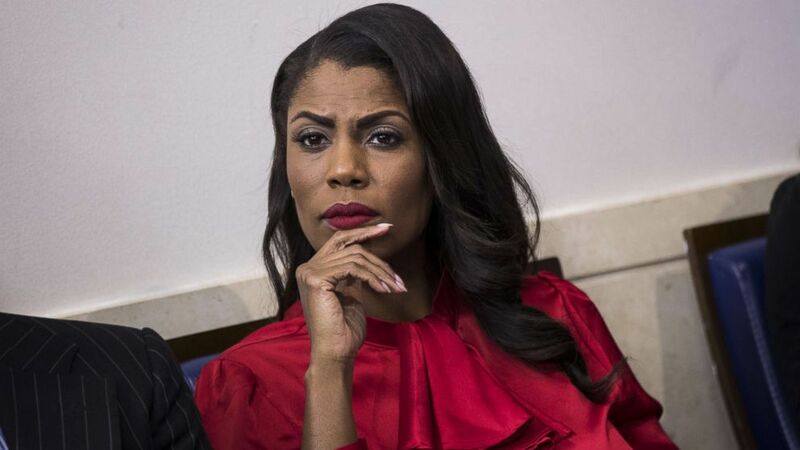 Omarosa Manigault Newman's former White House colleagues are looking into legal options to stop her from releasing more tapes and to punish her for secretly recording her conversation with Chief of Staff Gen. John Kelly, White House officials tell ABC News. White House press secretary Sarah Sanders responded to Manigault Newman's appearance on Meet the Press during which she played one of the recordings she made in the Situation Room when she was being fired after working as an assistant to President Donald Trump and director of communications for the Office of Public Liaison. "The very idea a staff member would sneak a recording device into the White House Situation Room, shows a blatant disregard for our national security -- and then to brag about it on national television further proves the lack of character and integrity of this disgruntled former White House employee," Sanders said. The claims Manigault Newman made in her soon-to-be-released book have been receiving swift backlash from the people she used to work with in the West Wing. Former White House press secretary Sean Spicer told ABC News her claims are "completely fictional." Spicer rebutted Manigault Newman's claim that he signed a non-disclosure agreement and called her assertion that he was paid hush money "false." He added that Manigault Newman had top secret clearance at a minimum, and she may have broken the law by recording her conversation in the Situation Room -- what's supposed to be the most secure place in the White House. Part of applying for clearance is agreeing to security protocols. "It's an unbelievable violation of protocol and the law," Spicer said. "You can lose your security clearance for bringing your device into SCIF -- to bring it in is a violation but to willfully record it -- you're entering a whole other realm." Many within the White House fear Manigault Newman will release their private conversations. "She's on a different level," a senior White House official said. "She terrified me." Manigault Newman takes both current and former White House officials to task in her new book, "Unhinged." Now there are concerns that her allegations will have more validity backed up by tapes. "People now understand that she has a lot," a former White House official said. "It's stopping people from punching back." While many say they guarded themselves from Manigault Newman, some fear their tangles with her will be broadcast, and they're unsure of just how many tapes she has in possession. "If you pissed off Omarosa, buckle up -- it's going to be a tough couple of weeks," said one former official. Another senior White House official described Newman as unprofessional, and recalled that she would shop online during meetings. The staffer said she witnessed Manigault Newman being verbally abusive to junior level staffers several times. Katrina Pierson, a former Trump campaign spokeswoman, said Manigault Newman is embarrassing herself by "creating salacious lies and distortions." On NBC's Meet the Press, Manigault Newman claimed that Pierson told her she had heard Trump say the N-word, a claim Pierson rejected. In a statement to ABC News, Pierson said, "Omarosa is being intentionally dishonest in order to sell her new book. First, I have never heard President Trump ever use the derogatory language that Omarosa claims. "Also, I never confirmed the existence of an alleged tape from 'The Apprentice' to her as she said today," the statement continued. "That's a complete fabrication by Omarosa." The statement continued, saying the president and his family have "always been kind, generous, thoughtful, and respectful to me and other people of color." "I was honored when he appointed me, a single mother, as the first black National Spokeswoman for a winning U.S. presidential campaign," it read. "I feel pity for Omarosa as she embarrasses herself by creating salacious lies and distortions just to try to be relevant and enrich herself by selling books at the expense of the truth. 'Unhinged,' indeed." Manigault Newman's book is scheduled for release on Tuesday.